Canada is famous for its cold, snowy winters and the hardy "can do" attitude of Canadians when dealing with the cold temperatures and high snowfall. I lived in Ottawa, ON for two years--and survived two winters there--and can attest to the hardiness myself. Snow in Vancouver can happen--though, again, it is RARE--during cold snaps in December, January, and February. 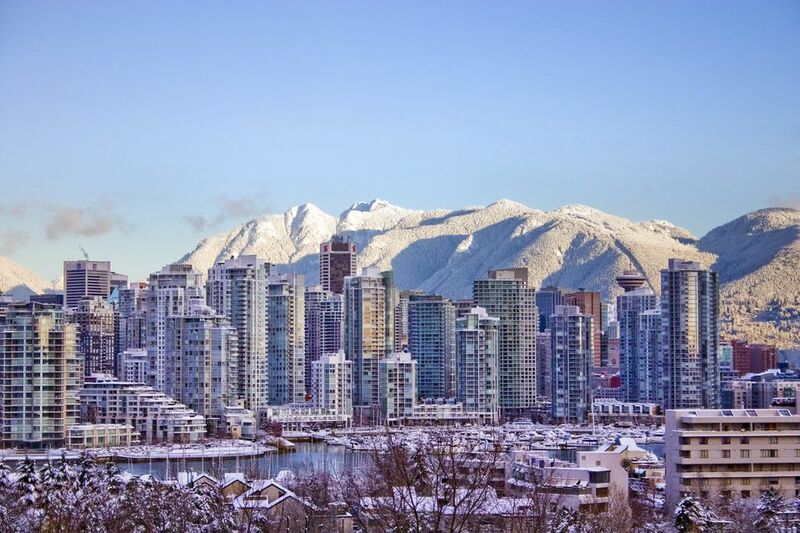 If you are traveling to Vancouver during the winter months, and there's a forecast that calls for snow, these are the seven things every traveler needs to know. Because Vancouver, BC gets so little snow--because it's such a rare event--the city is not equipped to deal with snow on the same scale as other Canadian cities. In Canada's capital of Ottawa, for example, snow removal, street cleaning, and sidewalk clearing in urban and commercial areas happen quickly and routinely throughout the winter season, making it easy to get around by car (with winter tires) or by foot, even with considerable snow on the ground. Not so in Vancouver! The rarity of snow makes it too expensive for the city to buy/maintain a fleet of snow removal/street cleaning vehicles; most years those vehicles would never be used. The city has some snow removal/street cleaning equipment, but when it snows, this equipment is used to clear only main thoroughfares and streets that are main arteries into Downtown Vancouver. The city can't take care of side streets, alleys (where many people in Vancouver park), residential streets, or sidewalks. If snow on the ground is sticking or the temperatures are freezing or below freezing, expect snow and ice to create major traffic delays and limit street parking. Because Vancouverites don't drive on snow routinely, they often avoid driving on snow days, which makes public transit buses and trains crowded. City buses may also be delayed due to to the bad traffic and driving conditions. If there's snow in Vancouver or a forecast predicting snow, the best thing travelers can do is avoid driving. Not only will you avoid bad traffic snarls and difficulty parking, the easiest and safest way to travel during snow storms in Vancouver is by public transit: city buses and the Canada Line / SkyTrain rapid transit (Vancouver's metro). Both are run by Translink; you can use the Translink website to plan your trip via public transit. You can easily get to and from the Vancouver Airport to Downtown Vancouver via the Canada Line public transit, and you can use a combination of buses and rapid transit to access most of Vancouver's top attractions. Important: If you do drive, be aware that there may be winter tire checkpoints--conducted by the police--on Highway 99 north of Horseshoe Bay. That is: If you intend to drive north of Vancouver toward Whistler, BC, you will need winter tires or you may be forced to turn back! Staying in Downtown Vancouver makes things simple because of the ease of using public transit to get around Vancouver from the Downtown core. This is doubly true if there's snow in Vancouver. Because snow in Vancouver slows everything down--and (if bad enough) closes some businesses and schools--staying Downtown is important. By staying Downtown and within walking distance of a Canada Line / SkyTrain Station you will also be able to walk to grocery stores, pharmacies, and shops. In other words: you can still get around and find everything you need, even if the road conditions are grim. If you're traveling to Vancouver, BC in the winter (December - February), you need to bring a winter coat, hat, and gloves and prepare for temperatures around 6ºC / 42ºF to 8ºC / 46ºF. You also need waterproof shoes, since it typically rains quite a bit in the winter. If there's snow--or a forecast for snow--temperatures will reach freezing and there will be ice on the sidewalks and streets. You will need snow boots or waterproof shoes with good traction. If you're caught in Vancouver during a snow storm, you can buy footwear traction devices from Mountain Equipment Co-op (MEC) (like the one pictured here) or another outdoor clothing retailer to add to whatever shoes you do have. You can also buy winter clothing supplies from Vancouver Discount Stores. (Expect crowds at places like Costco if snow is on the forecast.) In Downtown Vancouver, you can buy winter clothes on Robson Street or at the Hudson Bay Company ("The Bay") department store. Skate for free at the Robson Street Ice Rink in Downtown Vancouver. Skate rentals are $4. If it's too cold for outdoor skating, you can skate indoors at a Vancouver public indoor ice rink. Visit the Vancouver Aquarium, which is open 365 days a year no matter the weather! Enjoy Downtown Vancouver shopping, including the indoor Pacific Centre Mall and luxury shopping on Alberni Street. Tour Vancouver's Top Museums & Galleries. Enjoy unusual indoor activities, like indoor rock climbing and trampolines: Indoor Winter Activities for All Ages. Explore Granville Island; the famous Granville Island Market and shops are indoors, though you will have to walk outside to visit different parts of the island. You can reach Granville Island by bus from Downtown Vancouver or by Aquabus (dress warmly for the short water crossing). Enjoy special winter holiday events and activities: Top 10 Winter Activities in Vancouver. Take Advantage of the Snow: Go Skiing, Snowboarding & Snowshoeing! Obviously, the best benefit to snow in Vancouver means fresh snow--and lots of it--at Vancouver's nearby snow sports resorts. You don't have to go to Whistler for skiing and snowboarding; you can do both at nearby Mt. Seymour or Grouse Mountain. Do not drive to the mountains unless you have winter tires on your car! As mentioned, in a snowstorm or its aftermath, police may set up checkpoints on northern roads to check cars for snow tires and make you turn back if you don't have them. Use public transit or use the Grouse Mountain shuttle, which takes visitors to Grouse Mountain from Downtown Vancouver. Call 9-1-1 for emergency assistance. Like the USA, Canada's emergency phone number is 9-1-1. Use 9-1-1 for emergencies only, including car accidents, a car stuck in a snow bank (or in a hazardous condition), and medical emergencies like slips and falls. For information on non-emergency medical care and services for international travelers, read my Guide to Staying Safe in Vancouver. If you are driving, make sure you have emergency supplies with you, including jumper cables, an ice scraper, a flashlight, batteries, warm clothing, a charged cell phone, and bottles of water. Use winter tires and fill your gas tank. Take an old-school paper map with you, too, in case cell service or GPS is disrupted. If you're driving in winter in Canada, you may want to become a member of CAA (the Canadian version of the USA's AAA car and travel service). CAA members get road-side assistance and towing as part of their membership rewards. Beware of "black ice!" "Black ice" is the term for ice on roads that don't appear to be icy. That is, the ice looks "black" like the color of the road, and therefore you can't see that the road is icy (instead it simply looks normal). Black ice is one of the biggest hazards to snow in Vancouver since it can lead to car accidents and slips and falls. Even with winter tires, be wary of black ice by taking downhill roads slowly and allowing for more space between cars. For walkers, step carefully on shadowed sidewalks, as they may be icier than they appear.